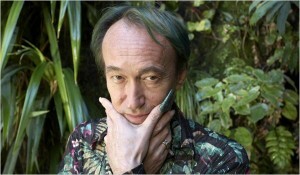 A quick glance at Patrick Blanc and you could be forgiven for wondering who the crazy looking little green-haired man was…a leprechaun? In actual fact, Blanc is the botanist and designer who pioneered the use of vertical gardens in urban settings…and his presentation at BoDW was riveting. The history of cities and modern urban development is a subject that is of great interest to me…I love cities and the built environment, which is definitely where my love of Architecture and Interior Design stems from. So Blanc’s discussion of the use of botanicals in cities to help purify the air is a subject also close to my heart, as well as many many others – a staggering 50% of the worlds population are now city dwellers! Blanc has developed a system in which plants can be attached to a vertical structure without soil. Since the structure is so light they can be used for interior or exterior features of almost any size. Irrigation and fertilization is built in with the system and requires infrequent maintenance, the only catch is interior walls need artificial lighting. The benefits of these lush and beautiful walls for everyone that inhabits or visits the city they are in are numerous. Not only do they look lovely (and often incorporate native species of the location) they, and the microorganisms that inhabit them, help improve the air quality by absorbing Carbon Dioxide and Volatile Organic Compounds. The system has been taken one step further and can even be setup for the plants to be irrigated by the recycled water waste from air-conditioners within the building. Green was already my favorite colour, and while I’m not sure I’ll take Blanc’s lead and change my hair colour, I would absolutely love to see more of this colour in the form of vegetation in cities around the world – especially the concrete jungle that I currently call home. 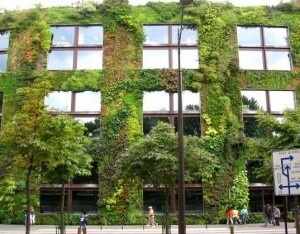 An exterior facade – or “vegetal wall” on a Jean Nouvel building in Paris. Incidentally, Nouvel was the first architect to approach Blanc to use his vertical gardens on exterior building facades. 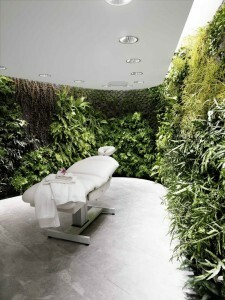 Another example of Blanc’s work, an interior vertical garden in the Sydney Qantas Lounge designed by Marc Newson. …I was here. It’s been grey and miserable here in HK today. 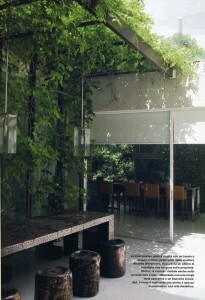 I’d love to be somewhere warm and sunny, in a nice spot like this, sharing lunch with friends. Photo from Elle Decor Italia. 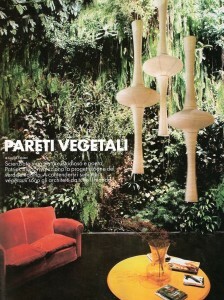 I discovered the work of French Botanist, Patrick Blanc just recently, and then stumbled upon this image (below) in the Italian Elle Decor yesterday. He has discovered a way of growing plants vertically. They are grown without soil, and can be installed indoors or outdoors, in any climate. I love this image, and its making me frustrated with my rental apartment and not being able to do anything with the outdoor area we have. Additionally, it seems that our family’s hereditary green thumb has skipped a generation, because I am only good at killing things – by overwatering, or underwatering…so alas, no garden for me! Patrick has worked with some very well known architects and designers (including Marc Newson & Andre Putman) on commercial and residential projects all over the world. I would love to commission him to create a vertical garden on the back wall of my courtyard, complete with watering system so it lasts longer than my usual gardening efforts. I highly recommend you take a look at his website for more photos.